Teenage striker Oli Shaw took advantage of a dreadful blunder by Kilmarnock goalkeeper Jamie MacDonald as Hibs hit back to take a point. The homje side were were caught cold after just 61 seconds as Chris Burke slipped the ball to Boyd on the edge of their penalty area, the Killie skipper wasting no time in firing in a shot which went in off Ofir Marciano's right hand post. But Shaw, denied a clear goal in the midweek derby against Hearts, was on hand to blast the ball home as MacDonald fumbled a John McGinn corner. Neil Lennon's side went all out for a winner, McGinn crashing a tremendous shot off the bar as Killie found themselves pinned down inside their own half for long spells but a second goal just wouldn't come for the Capital outfit. The Easter Road side attempted to hit back, Anthony Stokes feeding the ball out to Lewis Stevenson who fizzed in a low cross which was only inches out of his striker's reach as he attempted to get on the end of his return. And they should have drawn level 15 minutes in, Stokes latching onto Stevenson's pass down the left flank before cutting into the Killie penalty area and playing the ball back for Danny Swanson, making only his tenth appearance in a green and white shirt and his first start since mid-September, who could only drill his shot inches wide. 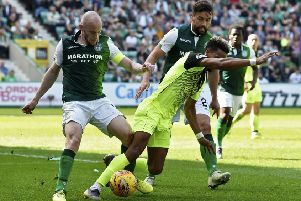 It had been all Hibs since that dramatic start and Efe Ambrose's pass allowed Martin Boyle to fire an inviting ball across the face of MacDonald's goal but there were no takers for what would have been a tap-in. Their pressure paid off in the 23rd minute when former Hearts No 1 MacDonald, fumbled John McGinn's inswinging corner, Shaw razor sharp as he was first to react, blasting the ball home from a couple of yards out. Killie came close to edging in front again at the start of the second half, Jordan Jones powerfully struck shot needing the touch of Marciano to put it over before MacDonald through himself to his left to push Stokes' free-kick round the post. However, it was Hibs who continued to hold the upper-hand, restricting Killie to trying to hit them on the break as they sought that second goal, Boyle and McGinn both going close but not close enough with shots which dipped over MacDonald;s cross bar. They edged ever closer to taking the lead with a thunderous left-foot strike from McGinn which crashed off the top of the bar with MacDonald well beaten. The danger for Hibs was as they surged forward that they would be caught at the back and McGinn was happy to take a booking as he brought down Jones as he threatened to do so with the home side short-handed at the back. Hibs: Marciano, Ambrose, McGregor, Hanlon, Stevenson, Boyle, McGeouch, McGinn, Swanson (Slivka 71), Shaw (S Murray 71), Stokes (Matulevicius 85). Substitutes not used: Dabrowski, Gray, Bartley, Porteous. KIlmarnock: MacDonald, O'Donnell, S Boyd, Broadfoot, Taylor, Burke (McKenzie 60) Power, Dicker, Mulumbu, Jones (Frizzell 85), K Boyd (Erwin 70). Substitutes not used: Bell, Greer, Findlay, Waters.